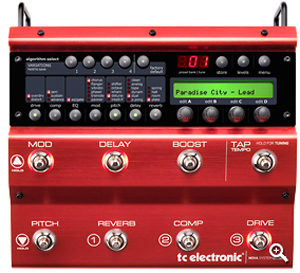 TC Electronic was among the first manufacturers to realize the value of an integrated guitar effects system. The original Nova System has proved its worth for years by now. provides a compact multieffects board that offers reverbs, delays, modulation effectsa and a purely analog drive block that is being digitally controlled which allows you to integrate various drive settings in your personal presets. Now TC has released Nova System Limited with a new color and new sounds developed by Ron ‘Bumblefoot’ Thal and Peter Thorn, created 20 presets each that they use every day when touring with Guns N’ Roses and Chris Cornell of Audioslave and Soundgarden. Peter Thorn is a long-time TC Electronic guitar effects user, owning no less than three G-Systems setups that he uses when touring the world, but with fuel prices skyrocketing, most airlines have imposed severe weight restrictions, which caused Peter to look for light alternatives to huge rigs. This is where Nova System comes in handy. Peter explains: “I still use my G-System in my main rig, but now I've had a really small pedalboard built that's based around my Nova System. It slips right into a roadcase, and it's perfect whenever I need portability and great tones! I used this setup for the first time at the 2008 Earth Day in Tokyo, performing with Daniel Powter. This was pretty much a fly in/set up/play/fly out kinda gig and Nova System performed a blast. The analog drive section sounds really warm and natural, so I can set my amp just on the verge of breakup and use the TC drive sounds to get all different levels of distortion happening. From warm and bluesy over thick crunch to super saturated solo tones! Obviously, the delays, reverbs and modulation effects are what you would expect from TC Electronic: pristine and awesome!" Finally, our guitar product specialist and demonstrator, Russell Gray, has created another 20 presets that are inspired by a number of specific, classic rock songs. For instance, he has created a spot-on preset tailored for ‘Another Brick In The Wall’ by Pink Floyd. Another example is a classic The Edge sound that is a perfect match for playing ‘Where the Streets Have No Name’ by U2. Just load the preset you want and you can start to use and enjoy it straight away – you could use it for the particular song that inspired the preset, but you could also use it as a source of inspiration for creating your own original riffs and personal presets. The choice is all yours! The Nova System Limited carries an MSRP of $499 USD or Euro.